Constabulary Garden was originally a mid to late 12th century earthwork motte and bailey fortress, founded by William the Lion. Standing against the River Nairn near the Brochar's Brae ford, the castle with its central keep was defended by timber ramparts and ditches to the north and west. Occupied by English troops under King Edward I during the Wars of Independence, in 1308 it was recaptured the Scots. The Calders as Thanes of Cawdor were its keepers and after passing to the MacDonald Earls of Ross, in 1475 it reverted to the Crown. Destroyed in the 16th century, the only trace of the castle is a possible cellar in an office of the Cawdor Estates. 2 miles south-east is Dooket Hill and 7 miles south-west is Cawdor Castle. 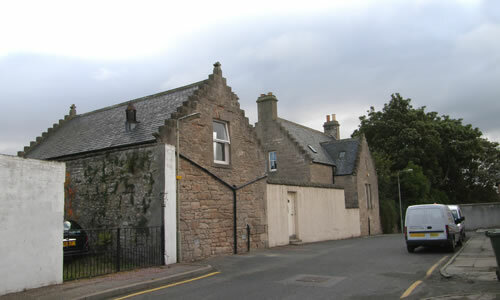 Constabulary Garden is located in Nairn, off Castle Lane. 16 miles north-east of Inverness, on the A96. On the site are the Cawdor Estates offices and the view from the road is restricted.